Have a look at the people behind the scenes..
Michael has been involved in development work in South East Asia since 1998. Prior to that he had worked for Barclays Bank in the UK for more than 20 years. He came to Siem Reap in early 2006 and liked the place so much that he ended up staying! During his time in Siem Reap he became aware of a paradox. The province has several hundred projects, some of whom have been here many years. Also, the town has become well known in volunteering circles and over time, lots of people have been volunteering or supporting the local projects. At the same time, the average length of stay in Siem Reap is only a few days. Many more people who simply come on holiday, and then want to offer their support, find it difficult or impossible to get information on how to help in an appropriate and responsible way in the short time they have available. Visitors often leave without being able to give their help, or maybe end up doing things that seem like a good idea, but which have a negative impact on the very people they want to assist. This was the idea behind ConCERT and Michael is very grateful to all who have contributed to ConCERT’s achievements. He lives in Siem Reap with his partner Salin and her son Lee How. He tries to visit the UK once or twice a year to see his family, in particular his father, his 2 grown up sons, and his 3 grandchildren. Salin is Michael’s partner and has been working with him at ConCERT since the middle of 2009. As Executive Director she is the principal officer, and the main point of contact for all administrative matters relating to ConCERT and the government. Salin grew up in rural Battambang province where the remnants of the Khmer Rouge continued their fight with the government until the late 1990’s. Her village was often caught up in the fighting and her schooling, typical of many rural girls, was cut short though she fared better than most as her mother is a teacher. In common with many thousands of Cambodians she moved to Siem Reap in search of work in the tourism industry to support herself and her son Lee How, who stayed in Battambang with her mum. In early 2010 Lee How came to live with her and Michael. In addition to her director’s responsibilities, since July 2012 Salin has been the project manager at Treak Community Centre, the school that is run by ConCERT. In that time the she has overseen the continued development and strengthening of the school, not least of which has been the building of a complete set of new classrooms, and seeing student numbers rising from 120 to over 470! Sary has lived in Siem Reap all her life so she knows all the insider tips about what to do during a stay in the city. She has attended public and private school where she has learned English for 2 years. After school she went to university to study Accounting and always further improved her English. Her first employment was for an NGO in Siem Reap where she became a head teacher for English for 2 years. At ConCERT Sary is the Finance Director, where her accounting skills come in very handy for management of the office finances. She enjoys meeting volunteers from all over the world when they come to stay in Siem Reap and is often the first person they meet when they arrive at their guesthouse. Sary is very passionate about working for an organisation where she feels she is doing a great service for her community! 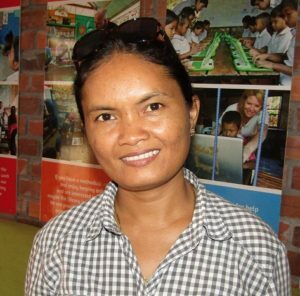 She gives child protection workshops in Khmer to staff from local organisations. In her family she is the eldest of 4 children. As her siblings are all boys she is the only one to support the household and is responsible for financial support of her family. During her leisure time she enjoys bicycle tours around the Angkor Park and Western Baray or meets friends for dinner. Sophea is from Battambang province and moved to Siem Reap in March 2016. She took English lessons for 1 year after school and went to university to study Banking and Finance for 3 years. Her first employment was for a micro-finance organisation where she worked in Accounting for 2 years and then became chief cashier for 2 years. 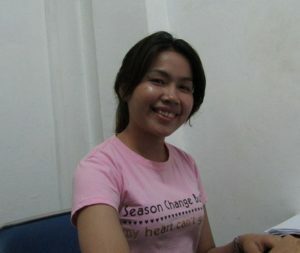 At ConCERT she is a programme support officer, She is responsible for much of the office administration and helps Sary to look after volunteers when they come to stay in Siem Reap. She enjoys meeting people from all over the world who are looking for ways to get involved. Sophea says, “I really love my job”.